We are not open on holidays. All of our merchandise is donated, and for that we thank the people of Princeton, Princeton Fringe, Tulameen, Coalmont, Osprey Lake, Allison Lake, Missezula Lake, the Princeton-Summerland Corridor (Five Mile Valley and Chain Lake Area), Eastgate, the Old Hedley Road, and Highway 3 to Hedley. 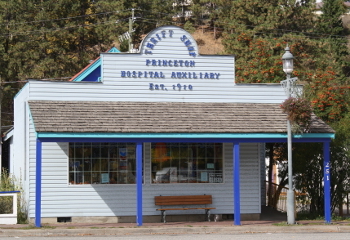 The Thrift Store is managed and operated entirely by Auxiliary volunteers from throughout the area. The store is our primary source of income. Clothing, hats, caps and scarves, shoes and boots, purses, knapsacks, etc. Bedding, table linens, curtains. Kitchen wares and home decor items, sewing, knitting, and craft supplies. Undamaged books, puzzles, board games. Essentially, any item that is easily carried and in good condition. Microwaves, television sets, computers. Furniture. If it needs two people to move it – it’s too big! Helmets and baby car seats -both have expiry dates- and cannot be accepted. If in doubt, call us! Please do not leave large items on the sidewalk outside our shop because we will have to pay someone to remove it to the landfill. Volunteering is good for you and good for your community.